Two suspects seen spray painting swastikas at park, elementary school in Washington, D.C., suburb with large Jewish population. JTA -- Swastikas were spray-painted at a park and an elementary school in a Washington, D.C., suburb with a large Jewish population. The swastikas were discovered Sunday in Rockville, Maryland, the Washington Post reported Wednesday. A witness said he saw two white boys spray-painting the swastikas, according to the Post. 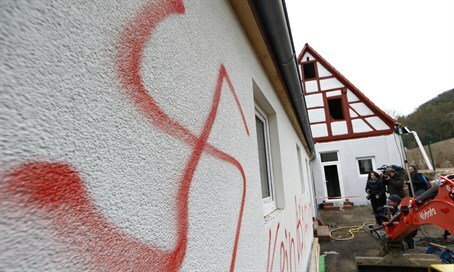 “Even though some people think it’s just offensive graffiti, you must understand it really offends community members deeply,” Ron Halber, the executive director of the Jewish Community Relations Council, told The Washington Post. “It’s not just a matter of getting over it." Rockville, the center of the Washington metropolitan area's Jewish population, has a JCC, a Jewish nursing home, a Jewish day school, synagogues and kosher restaurants.